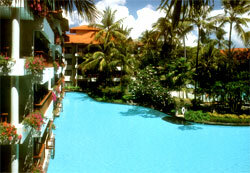 The resort is ideally located just 20 minutes from Bali's International Airport. Covering some seven hectares of beautifully landscaped gardens and swimmable blue lagoons, the resort is conveniently located adjacent to the Bali International Convention Center and the 18 holes championship Bali Golf & Country Club. The resort boasts 276 rooms including 19 suites and 58 swim up lagoon access rooms, all beautifully appointed with glowing timber floors and Balinese artworks. All rooms are fully air conditioning, equipped with IDD phones, satellite TV, in house movies, fridge/mini bar, in room tea/coffee maker, room safe and hairdryer. All rooms and suites offer 24 hours room service. The lap of luxury�where the most rooms enjoy tranquil views over cool lagoons. And lavish suites adjoin the soothing waters. International fare at its finest. Balinese cuisine at its best. A choice of superb settings enhances every dining experience. 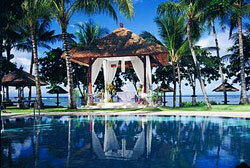 The height of Balinese hospitality�each guest pampered with personalized butler service, any time day or night.